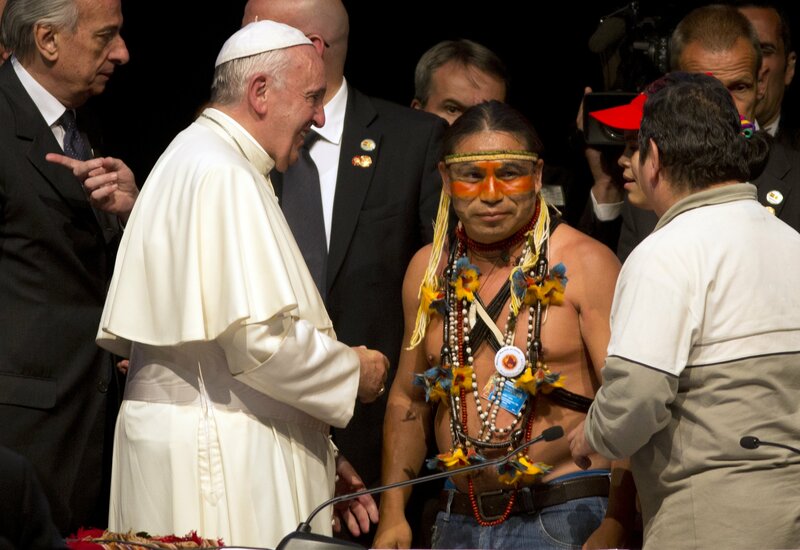 “We accept the apologies that are more than we could have hoped for from a man like Pope Francis,” said one indigenous leader, Adolfo Chávez. Francis’ apology was also significant given the controversy that blew up the last time a pope visited the continent. Benedict XVI drew heated criticism when, during a 2007 visit to Brazil, he defended the church’s campaign centuries ago to Christianize indigenous peoples. He said the Indians of Latin America had been “silently longing” to become Christians when Spanish and Portuguese conquerors violently took over their lands. Amid an outcry from indigenous groups, Benedict subsequently acknowledged that “shadows accompanied the work of evangelizing” the continent and said European colonizers inflicted “sufferings and injustices” on indigenous populations. Mexican Bishop Raul Vera, who attended the summit where Francis made the apology, said the church was essentially a passive participant in allowing natives to become enslaved under the Spanish “encomienda” system, by which the Spanish king granted land in conquered territories to those who settled there. Indians were allowed to live on the haciendas as long as they worked them. “It’s evident that the church did not defend against it with all its efforts. It allowed it to be imposed,” Vera told The Associated Press earlier Thursday. 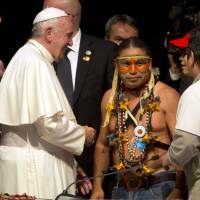 He noted that John Paul had previously asked forgiveness of the world’s indigenous. But he said Francis’ apology was particularly poignant given the setting. In 2000, during the Vatican’s Holy Year, the Catholic Church apologized to Brazil’s Indians and blacks during a ceremony in Brazil for the “sins and errors” committed by its clergy and faithful over the past 500 years. A Vatican cardinal representing John Paul participated in the ceremony, which saw the head of Brazil’s bishops conference ask God for forgiveness for the sins committed against brothers, especially the Indians. Earlier Thursday, Francis denounced the “throwaway” culture of today’s society that discards anyone who is unproductive as he celebrated his first public Mass in Bolivia, South America’s poorest country. The government declared a national holiday so workers and students could attend the Mass, which featured prayers in Guarani and Aimara, two of Bolivia’s indigenous languages, and an altar carved from wood by artisans of the Chiquitano people. 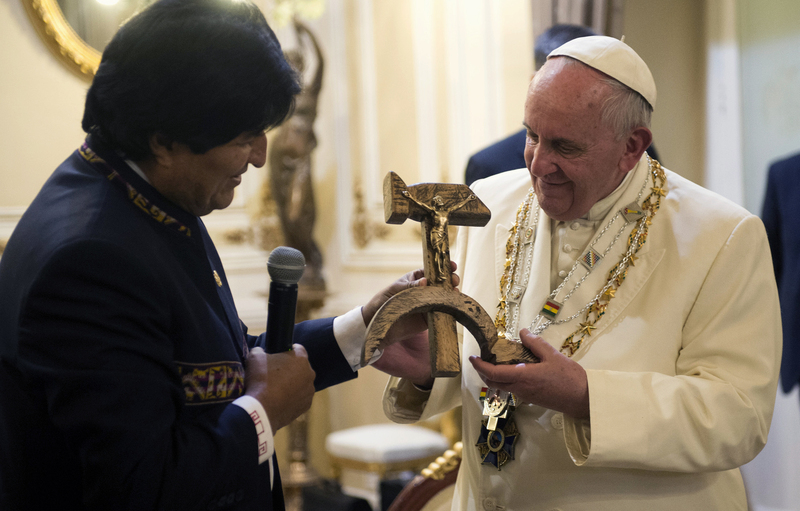 The day, however, threatened to be overshadowed by the Bolivian president’s controversial gift to Francis upon his arrival: a crucifix carved into a hammer and sickle. Both the Vatican and the Bolivian government insisted Morales wasn’t making a heretical or political statement with the gift. They said the cross, dubbed the “Communist crucifix,” was originally designed by a Jesuit activist, the Rev. Luis Espinal, who was assassinated in 1980 by suspected paramilitaries during the months that preceded a violent military coup in Bolivia. On Wednesday, Francis, a fellow Jesuit, prayed at the site where Espinal’s body was dumped. “You can dispute the significance and use of the symbol now, but the origin is from Espinal and the sense of it was about an open dialogue, not about a specific ideology,” said the Vatican spokesman, the Rev. Federico Lombardi. 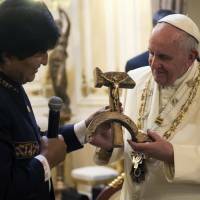 The Bolivian government said the gift wasn’t a political maneuver, but rather a profound symbol that Morales thought the “pope of the poor” would appreciate. “It was really from great affection, a work designed by the very hands of Luis Espinal,” Communications Minister Marianela Paco told Patria Nueva radio.